So after playing a monk to level 30/31 and enjoying it, I decided to use my “boost to 90” option on that char. And things immediately changed. Initially, it was disorienting because I lost the skills I had and was back to a minimal rotation. It seems when you boost a char, you get some nice gear (your original stuff is mailed back to you), bags, gold (150 I think) and you then have a small quest chain to open up the rest of your skills, talents, glyph slots, etc. I can see why Blizzard did this, rather than just dump everything on a new char – I’m sure a lot of current players will boost a class they hadn’t leveled much. For me it was only annoying because I used the range taunt Provoke quite a bit, and that was a skill that wasn’t restored to me until I finished the quest chain. 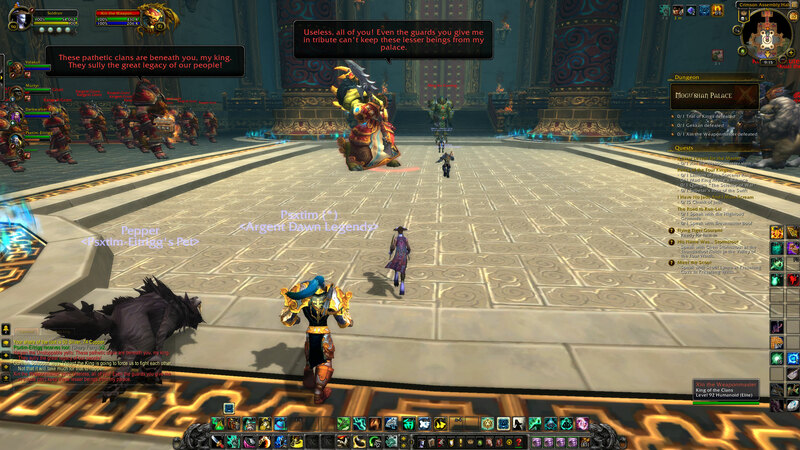 My friend met me in Stormwind and showed me how to get to Pandaria, and we threw in queueing for instances and a raid. And they were tons of fun! 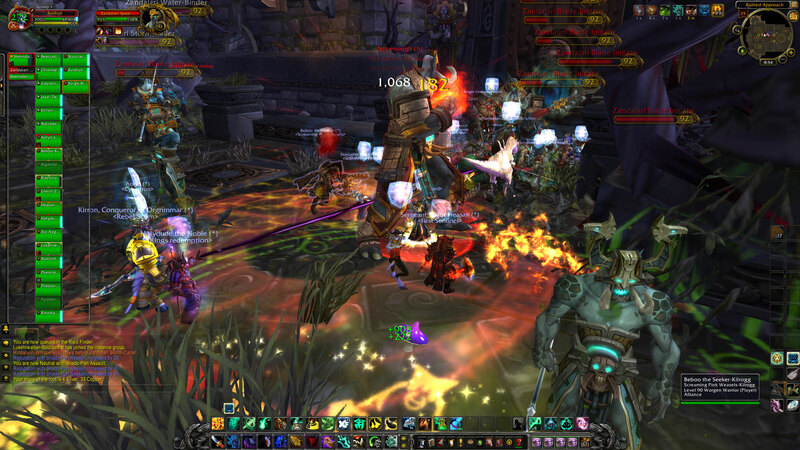 This is what I think of when I think about WoW – endgame instances, crazy boss fights and so on. I had never really experience any of it before. The previous times I tried WoW my friends preferred to run me through a dungeon (i.e. I was a lowbie compared to them so they’d just bring their max level chars and annihilate everything). It would take too long (for them) level start a new char and catch up to me, and the same was true for me to catch up to their lowest level chars. I was at an awkward middle level, too high to quickly reach, too low to really do anything they wanted to. But this boost has changed everything and lets me group with friends without convincing them to level another char, or me focusing entirely on leveling to catch up. We group for a solid 2 hours, doing whatever instances popped and I had a ton of fun. It got even better a few days later, as a 2nd friend joined us. So we were a group of 3: tank, healer, DPS; and queued up for a bunch more stuff, all 5 man dungeons/instances this time. It was super fun as well. In fact, so much fun I’m half tempted to pay for a boost on another character, just to have two level 90s to switch between for added variety and flexibility. But I’ll think about that first a bit more. I enjoy leveling and do want to work at least one char up through the various zones. It’ll partly depend on whether a friend is also interested in leveling a char; then we’d just set those chars aside for grouping with each other. My perspective on in-game money has changed. Before, when I had played ~30 levels and saved up a grand total of 5-8 gold (I can’t remember if I did buy a gear upgrade at auction or not), money was always tight. I’m not rolling in it now, but so many quests in Pandaria award 9-11 gold, I’m stunned even a week later. I just haven’t gotten used to making about twice as much gold as it took me 30 levels to make, in a single quest. I understand completely now why prices are skewed and things always seemed to expensive. Now with my max level char (at least until tomorrow when WoD releases, haha), quests award gold instead of XP and this is an amazing way to earn money. Longer term players with more high level chars probably have 100x or more than me and without any real gold sinks, just bid up everything to sky high levels; hence the ridiculous pricing and outrageous inflation. But now, I have a char that can dip into this income stream and that gives me (a bit of) in-game financial freedom. My 90 monk basically earned the gold to buy decent bags for all my alts and it is still piling up. I kinda like harvesting my own materials (mining, herbs) so I can save for other nice things to have, like glyphs or other misc items I haven’t run into yet. Perhaps buying dual-talent trees, etc. I’m not complaining; it’s great to not be under money pressure that probably 99% of the playerbase cannot imagine having. I’m also enjoying questing in Pandaria: the soundtrack is awesome, nice harp/strings background Asian-influenced music. It isn’t ground breaking stuff, lots of the usual quests, but with a flying mount and being decently geared and leveled, it goes quick and there is so much to do. I’ve been working on the storyline, doing solo instances to unlock new outposts, with the occasional session play tossed in. The worst thing continues to be open world PvP. It’s just as terrible as it always is, with ganking out numbering the “fair” fights 3 or 4 to 1. And “fair” is still pretty iffy as most players either wait until their side outnumbers you or opportunistically jump while you are partly distracted fighting mobs. That’s fine, I can keep situational awareness up and partially mitigate those situations. But there really isn’t anything I can do when a stealthed char hit my level 15 alt for 3200 overkill. I just run back, rez, and keep going. I tell myself I’m not pathetic enough to creep around stealthed and kill players that have no chance whatsoever of fighting back. Actually, if Blizzard didn’t offer a character boost I probably wouldn’t have resubbed and played on a PvP server.